Try and pull that bit of loose thread and your jumper will fall apart. The European Union fabric can fray easily. On its fringes, Gibraltar is a dangling piece of yarn perhaps best left untouched. The Rock is a well-earned nickname; it’s not just its shape. This British Overseas Territory is tough; it’s put up with all sorts of attacks. Even from El País, a pluralist paper, known for its authoritative, balanced commentaries: a journalism model whose surprisingly spiteful ink has often criticised Gibraltar and Spanish ministers alike. The long-drawn debates around the British colony saw a sharp swerve in the summer of 2013. The Gibraltar government sank seventy spiked concrete blocks into the sea to hamper Spanish fishermen, who had been accused of poaching Gibraltarian fish. A spectacularly provocative measure that prompted Spain to ignite Franco-regime-like reprisals. The border was indeed shut off between 1969 and 1985, during which time the colony’s airport was partially built on waters Spain claims as its own. Gibraltar is well connected to its Spanish hinterland region, where unemployment sky-rocketed in recent times. Luckily the British colony has been enjoying growth all along (7 per cent in 2013), offering job opportunities to anyone willing to commute. Yet Gibraltar can’t help being looked at with suspicion. Anything to do with decades of Spanish bad-mouthing? Any truth in it? Eighteen months ago chief minister Fabian Picardo happily told the New Statesman that “we are governed by the rule of law. […] The British way of doing things is hugely important”. The piece is an advertorial; and it shows how desperately The Rock wishes to be perceived. Fast forward eight months to August 2014. The EU changed its mind on The Rock. El País stood ready to board; the headline: ‘The Gibraltarian underworld’. The EU Commission grew unsure of Gibraltar’s self-proclaimed squeaky-clean image: smuggling and money laundering were its growing concerns. EU observers on a mission to the narrow peninsula found out that 110 million packs of cigarettes had been illegally sold on the Spanish black market via Gibraltar. The World Health Organization affirmed illicit tobacco has been drastically curbed in Spain in the past years: other ways in have perhaps opened up. The wider picture: a 2002 referendum rejected a joint sovereignty. 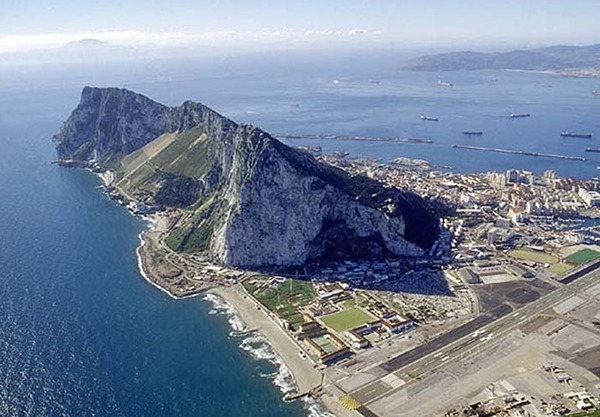 Scaling up Gibraltar’s participation in the EU – The Rock firmly rejects a Brexit – and allowing it to have its own MEP as part exchange for abiding more strictly to continental standards could be a compromise. Shrewd diplomacy is once more required. Especially if you still like wearing that old but cosy jumper of yours. Otherwise just pull the thread and see what happens. It could be quite fun to watch, you never know. The fact that Gibraltar imports far more cigarettes than it has a market for, shows some kind of corruption right there. Where do the authorities think that all those container loads of cigarettes are going to end up? A pity Alessio Colonelli has not bothered to research beyond a cursory glimpse at El País and the New Statesman. If he had done so, there would be fewer mistakes of fact in his piece which basically lead one to doubt his line of reasoning. The Airport was not built during the closure of the frontier under Franco’s dictatorship – it was built in the Second World War and was instrumental in the Allied North Africa campaign. Gibraltar’s cigarette consumption is totally legal and in line with the 12 million visitors the country has per year and who, like anywhere else, can buy duty free cigarettes. Cigarette smuggling is a problem as elsewhere in Europe. In this particular case it is not helped by the fact that Spain regards all apprehensions under a €15,000 threshold as a minor offence which is only fined. Gibraltar already has six MEPs as it is part of the South West England constituency. Gibraltar is fully integrated into the EU and observes all EU rules regarding fiscal transparency. All EU investigations so far have given the green light to Gibraltar’s legislation. It might be worth investigating why Spain’s policy towards Gibraltar has not changed since Franco. Spain is the only country to have transitioned from dictatorship to democracy without any type of reckoning with the crimes committed or their perpetrators. Franco still rests in the national monument of El Valle de los Caídos. Can you imagine Hitler’s tomb in Germany receiving coach loads of visitors? Food for thought. Gibraltar is very happy to be a city state under the British Crown as it has for the last 310 years, far longer than it was ever Spanish. Where do you think all those cigarettes come from? Spain sells them to Gibraltar. Spanish citizens then come to Gibraltar, buy them and try to smuggle them back. The problem would be rapidly solved if the Spanish stopped selling them – but they are too greedy to do that. Besides, the Spanish citizens need to smuggle and sell the tobacco – because Spain does not provide them with jobs! The land on which the airport was built was part of the neutral ground claimed by Britain after Spain broke the Treaty of Utrecht and repeatedly laid siege to Gibraltar. The Spanish like to claim that the Isthmus between the current border and the Rock was not part of the Treaty which ceded Gibraltar to Great Britain forever. The fact is that Spain would not have lost the Isthmus if they had stuck to the treaty. By invading they lost the Isthmus and the airport was extended in the Second World War. When the United Nations Conventions on the Law Of the Sea (UNCLOS) was signed by the Spanish, they attempted to exclude Gibraltar’s territorial waters. However, the conventions did not allow Spain to make an exception and the British pointed this out at the time. United Nations charts agree with the legal delineations shown on British Government charts and that the Isthmus, the airport and the waters where the concrete blocks were laid are all British territory. As for the matter of tobacco, as I pointed out below, the Spanish sell and ship the cigarettes into Gibraltar, only for the Spanish and tourists to buy it and attempt to smuggle it back. It would be simple enough for Spain to stop selling the tobacco to Gibraltar in the first place! Even so, Gibraltar has raised the tax on tobacco considerably and they are still cheaper than in Spain. This suggests that the problem is still that Spain does not provide worthwhile employment to the Spanish, who are forced to smuggle to provide for their families. An even bigger problem than Gibraltar is Greece’s inability to pay their debts. The Left-wing Government made promises to the Greek people that they would not put their economy in jeopardy by making repayments, yet they continue to make them. It is only a matter of time before Greece can no longer make the repayments and the Euro will crumble after their exit from the Euro-zone. If the recent polls are to be believed, then the Spanish right-wing PP Government will be replaced by a left-wing party and Spain too will head for the Euro exit. What about a self-determination solution? I though they came by sea. If they come in from Spain then both the Spanish and the British side are daft. How hard would it be for the Gibraltar side to close down the cigarette smuggling business? On the contrary, its time for Britain to leave Gib and the Falklands, last vestiges of a past colonial heritage. Either that, or Spain to walk in and reclaim the Rock, and the Argentines to take over their Maldives. Maldives? India wouldn’t be happy about that. The Argentines have never had a legitimate claim to the Falkland Islands. They attempted to seize land that was British territory from 1765. The Spanish had already abandoned their colony and British ships continued to visit the Islands. When the United Provinces of the River Plate sent troops to the Islands on 10th October 1832, they were evicted by a British warship on 5th January 1833 without a fight. The Argentines were illegitimate squatters. Furthermore, Argentina signed a peace treaty in 1850 which stated that there were no outstanding disputes. The Falkland Islands were not even mentioned in the treaty. Argentina gave away any claim to the Islands in that Treaty. As for Gibraltar, Spain gave it away forever. They can never claim it back. The rights of Self-Determination as enshrined in Article 1 of the Charter of the United Nations (to which Spain and Argentina are signatories), means that Gibraltar and the Falkland Islands have the right to determine their own future. Both have voted to remain British territories and therefore no-one has the right to say otherwise – not even the British Government! The solution is simple enough damon. If the current right wing PP Government were replaced with a more enlightened left wing Government, then they could provide the unemployed in Andalucia with jobs – so they would not need to smuggle tobacco to put food on the table! There is no such thing as ‘forever’ in Foreign Affairs. Britain will have to concede that Spain being proximate and deeply involved in the Economy of Gib can take it back one of these days. And in Good King Charles’s Days, I suppose you could also acquire territory by ‘conquest’, because that’s exactly how Britain ‘acquired’ most of its colonies from the indigenous populations. Then maybe you need to read the Treaty of Utrecht, then look up the definition of ‘Forever’ in Websters! … as I said ‘forever’ is always open to interpretation. Its all legalese anyway. You’re not Frank from Brisbane by any chance ? Please get your facts right! If Gibraltar relied on Spain for tobacco they would be reaping commision on the sales and would therefore not complain! Spanish cigarettes are not popular local consumption! As for our Economy, thank goodness that we are self sufficient or we would have been absolutely left dried out and without means of communication! what does Spain do? It bites the hand that feeds them. To all and sundry I say: come, visit our homeland and get to know us. By the way have you seen the size of Gibraltar and the rest of the Spanish coastline????? Logic says smuggling is simply impossible via this beautiful Isthmus but if it were to exist………please check the nationality % that actually carries this out…………sadly their own unemployed, homeless families desperate to earn a living. I had the pleasure to exercise with the British Army in Gibralter during 1992. The exercise was widely reported in the Gibralter Press. It was a privalage to be escorted through the tunnels by a member of the Gibralter Regiment. I have fond memories of Gibralter and the people who are more British than the British. If the Spanish try any of their dirty work again then we will send in the veterans of the Black Watch and that will be the end of the matter. You are cleary not informed. A task force is not required. Modern weapons are now deployed in the Falklands. And then there is the nuclear subs. Do you honestly think that any right minded Govt is ever going to use nuclear weapons, particularly over the Falklands? Maybe the Pope should arbitrate on this dispute and declare that they belong to the Argentines. I assume you think the Spanish should hand over Meliila & Ceuta to Morocco as well ? Lets put it this way, if they don’t, you’ll get hoards of refugees taking a boat trip to M&C, and they’ll be in Europe and can then continue their trip journey to the UK by courtesy of a container lorry. The Pope should put the perverts in his own house in order before interfering in British territiory. The subs have non nuclear weapons. In any case the Pope is a Catholic and who listens to that lot anymore.